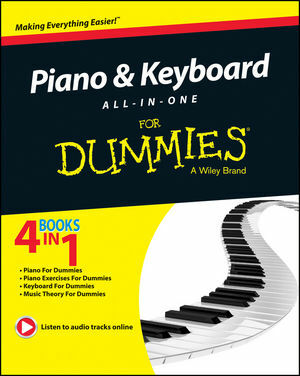 Piano & Keyboard All-in-One For Dummies makes it easier and more fun than ever to make music! If you don't know how to read music, this book explains in friendly, uncomplicated language all the basics of music theory, and applies it to playing the piano and keyboard. And if you've been playing for awhile—or took lessons when you were a child but haven't played since—you can pick up some valuable tips to improve your playing, or use the book as a refresher course. This indispensible resource combines the best of For Dummies books, including Piano For Dummies, Keyboard For Dummies, Music Theory For Dummies, and Piano Exercises For Dummies to get you up and running in no time. The handy reference helps you to master the traditional black-and-white keys and gives you an understanding of the possibilities that unfold when those black-and-whites are connected to state-of-the-art music technology. Dive right in! This comprehensive book offers the most complete learning experience for aspiring pianists, keyboard enthusiasts, and students of music. Holly Day has created work that has appeared in over 3,000 print and electronic publications internationally.